Did you know that platinum mining and production entails extreme energies and massive costs? Extraction, concentration and refining of the metal require quite complex processes that may take up to six months. It is estimated that in order to produce a single ounce of platinum, a volume of 7 to 12 tons of ore must be processed. So, in the end, every recycled catalytic converter counts. 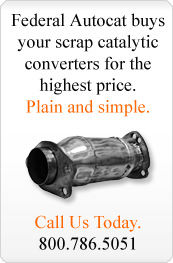 Our catalytic converter trade-in program lets you do your part and get paid for it! Federal Autocat, through its sister company Eastern Catalytic and their catalytic converter trade in program, will send you a check when you trade-in your spent catalytic converter upon the purchase of a new one from Eastern. Upon receipt of your new catalytic converter, enclose the old one into the same packing box with the prepaid postage label we provide. Upon delivery to Eastern, we will grade your returned unit and send you a check in four to six weeks. Soon thereafter we process and refine its PGM and apply them to new converters! For catalytic converter trade-in and pricing questions, please contact Manoj Sathananthan at 800.786.5051 ext 110.